Tokyo Disney Celebration Hotel is a value hotel at Tokyo Disney Resort. The hotel sits off property but is far cheaper than the other Tokyo Disney owned resorts. Celebration Hotel is rebrand from an existing hotel is divided into two wings, Wish and Discover, which embody Fantasyland and Adventureland. 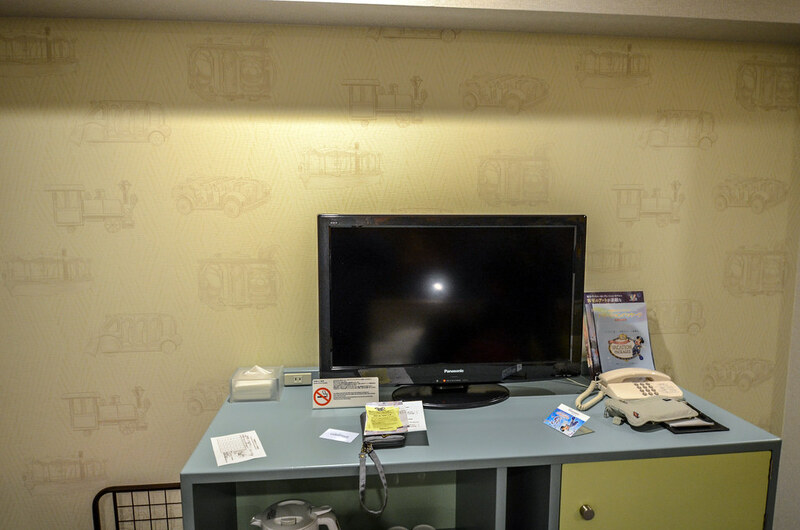 We recently stayed at Tokyo Disney Celebration Hotel and this review will cover that experience. To call Tokyo Disney Celebration Hotel a Disney Hotel feels a little disingenuous. There are certainly details sprinkled throughout the hotel, some subtle and some in your face, that remind you of who the hotel is owned by but this isn’t the magnificent architecture and detail that the other Tokyo Disney Hotels have. This is the sprawling resort that guests are accustomed to at Walt Disney World either. Tokyo Disney Celebration Hotel is simply a hotel with a little bit of Disney added in. There absolutely isn’t anything wrong with that. As we’ll break down later, we had a decent experience at the hotel and were pleased with the room size and service. 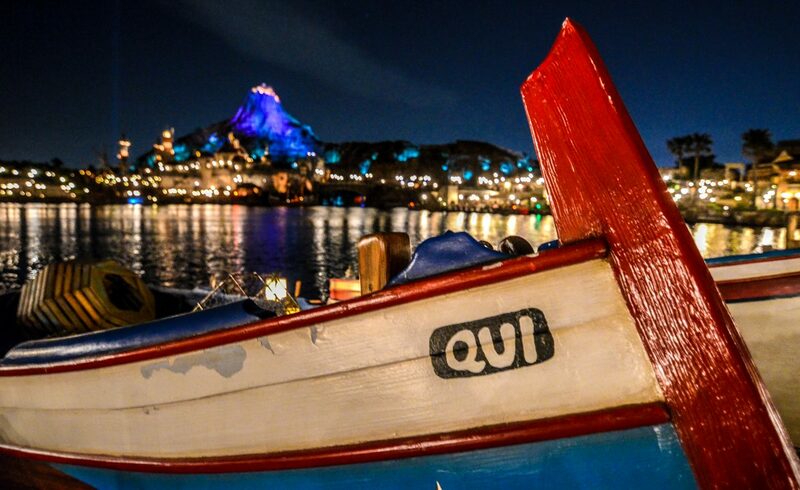 But, there are better options of places to stay at Tokyo Disney Resort both in terms of value and accommodations. As I mentioned, Celebration Hotel is broken into two portions and we opted for the Discover side. The Wish side is reminiscent of Fantasyland. While we didn’t see the rooms on that side, the lobby is filled with teacups (the attraction vehicle, not literal cups), a Minnie Mouse sculpture and other trinkets to remind guests of Fantasyland. 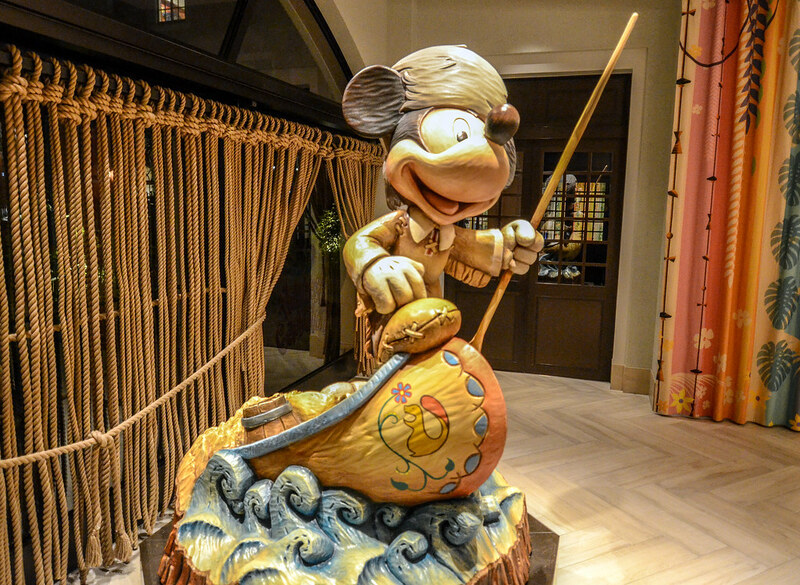 On the Discover side there was a Mickey sculpture in a canoe, models of attractions and ride vehicles and some fun paintings to enjoy. 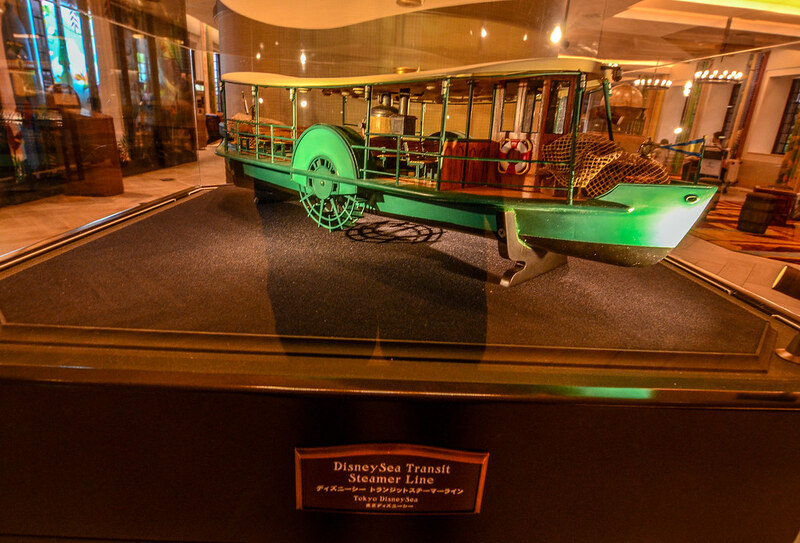 My favorite detail was the model of a DisneySea Transit Steamer Line boat. The room had a few more obvious details. One of the walls in the room has a large mural, with all things adventure. 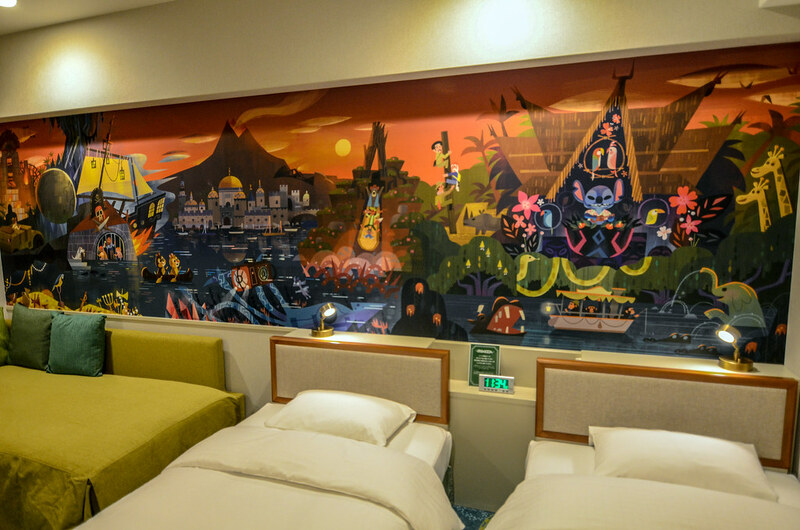 Taking from both Tokyo Disneyland and DisneySea, the mural was a really fun aspect of the room albeit a little in your face. There were four twin beds in the room, the two under the mural and then these two off to the side. The beds were comfortable enough. Mattresses were a little hard but that’s more or less the norm in Japan. While this didn’t quite measure up to the beds we had at Tokyo Disneyland Hotel (where we had just come from) I have no complaints there. As you can see in the above photo, the carpet had some detail on it as well although I’m fairly confused about how it fit into the adventure theme. I guess discovering outer space? We’ll go with that. The whole room was fairly small but used the space well enough. This continued into the bathroom. 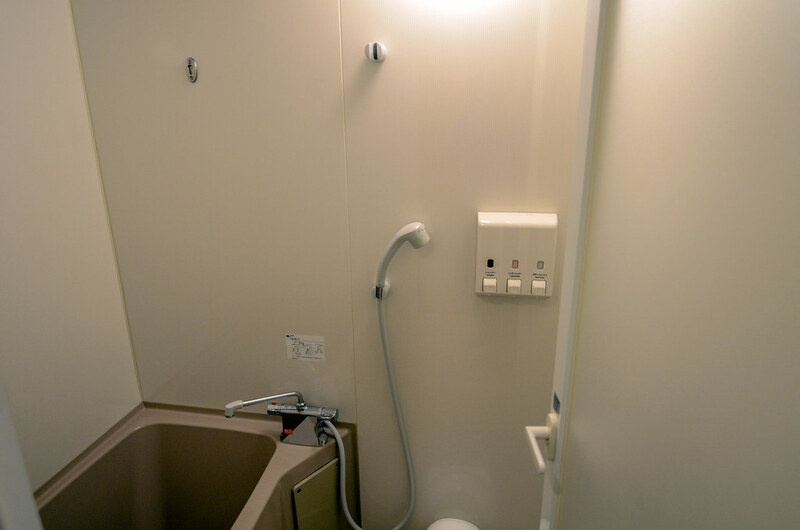 Sticking to Japanese custom, the sink, toilet and shower were all in separate spaces. Those spaces were small but they did the job. One of the worst photos I’ve ever taken! The shower room had both a bathtub and a shower in an extremely bland room. All in all, I thought the room was fairly nice for being what it was. The mural and wall paper was a great addition and the bedding was decent. It was fairly cramped in there but not terribly so. There were still some obvious aspects left over from the previous hotel like the bathroom area but it was still a solid room. The rest of the hotel had a few amenities including a convenience store and restaurant. We didn’t partake in the restaurant but I’ve mainly read negative reviews on their breakfast offerings. The convenience store was typical of what you’d find throughout Japan but still very nice to have. They had a good selection of food, drinks and other accessories. There was also a small courtyard outside with some gardens. When looking solely at the hotel, I think it’s a decent option. It won’t blow anyone away but it is equal to, if not superior, to the rooms at a value resort in Disney World. The amenities don’t measure up to the comparison but they aren’t bad. I will also say that the service we received here (and throughout Japan) was excellent and very helpful. Where Tokyo Disney Celebration Hotel falls apart is the location. It takes a 20 minute bus ride to get to the parks. 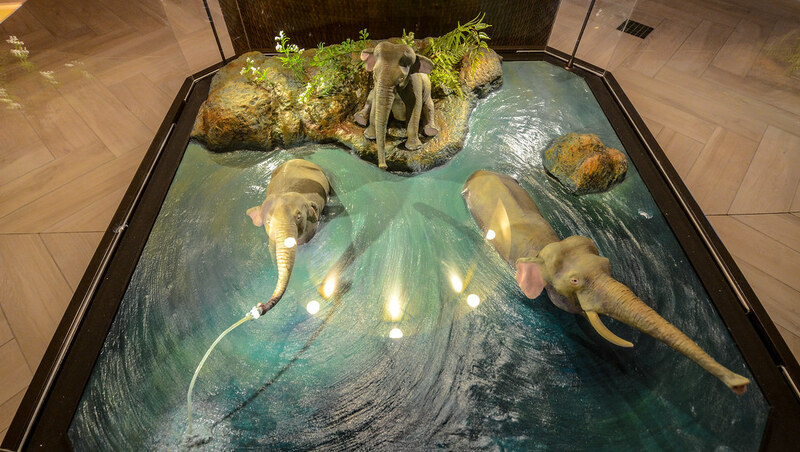 While that ride is included in the hotel cost, the time itself is a drawback. 20 minutes may not seem like a big deal but there are hotels right beside the parks that are around the same price point and offer better accommodations and amenities. That brings us to the value of the hotel and if it offers anything special to offset the distance from the parks. Tokyo Disney Celebration Hotel does offer a 15 minute early entry to the parks. That is fairly helpful and will let you get a headstart on some of the lines. Still, I don’t think that makes up for the travel time. There is nothing wrong with Tokyo Disney Celebration Hotel. The price is typically fair, in the $150-$175 per night range. 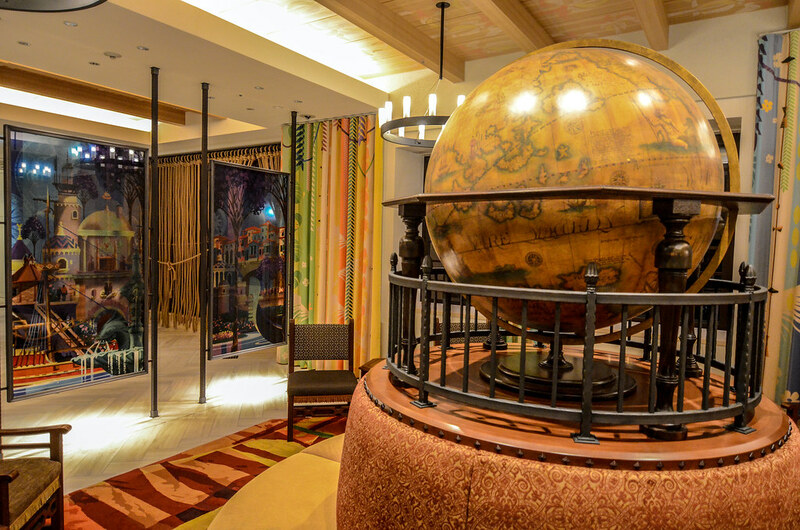 The lobby and rooms are fun with some interesting Disney motifs and the service we received was wonderful. Unfortunately, the hotel just doesn’t measure up to its competitors. My thoughts on this are similar to Disneyland’s Paradise Pier Hotel, although Celebration Hotel is found at a cheaper price. There just isn’t enough offered by the hotel and the building itself is too ordinary to make staying here worth it. It’s not really the hotels fault, it’s just that the Tokyo Disney Partner Hotels offer something better. Because of that, we don’t recommend staying at Tokyo Disney Celebration Hotel. If you have any thoughts or questions about the Tokyo Disney Celebration Hotel, or and Tokyo Disney Resort in general, let us know in the comments. 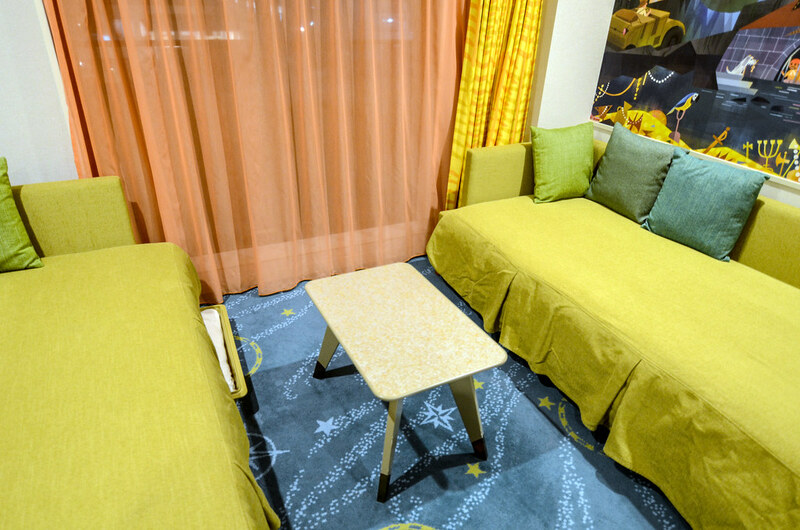 For more information on where to stay at Tokyo Disney Resort, we have this post. If you enjoy what you’re reading please subscribe to the blog and like our social media pages which you can find on the right side of this page. Thank you for reading, we really appreciate it! I am thinking about booking here a few nights before moving over to the Disneyland Hotel and my main reasons are Happy 15 & the ability to make dining reservations! If it wasn’t for that we would absolutely stay at the Hilton. If you don’t mind me asking, what month are you going?